We live in very challenging times! Many are searching for a spirituality to suit their twenty-first-century needs and many young people have joined this search. However, I fear too few are engaged in a serious search. My hope is that this book will assist the serious searchers to find their spirituality in the Eucharist. What do I mean by ‘spirituality’? By ‘spirituality’ I mean a set of beliefs and practices that put us in touch with the sacred other world that is bigger than ourselves, that develops within us a wholeness, that moves us toward a maturity of mind and spirit, and that motivates us to help others, especially the less fortunate. At this present time it could be bewildering as there are so many different kinds of spirituality being promoted: Eastern religions such as Buddhism, Hinduism, Islam, Confucianism; New Age; indigenous; as well as Christianity in its multiple variations – more bewildering than when you stand in front of the refrigerator at the supermarket and try to decide what kind of milk to buy! Within the Catholic tradition itself there are various spiritualities. Some stem from the religious orders. So we have Franciscan spirituality which highlights poverty, Jesuit spirituality which focuses on the spiritual exercises of Saint Ignatius, Carmelite spirituality, which is directed to contemplative prayer. Then there have been spiritualities based on the hermit life style; some based on severe penances and some based on making reparation to God for sin. Spiritualities flourish when they suit a particular time in history or a particular culture. When they no longer suit, they fade away. All these spiritualities can be helpful but they do not replace the basic spirituality that comes from the most important event in the life of Christ, namely, his death and resurrection which is commemorated in the Eucharist. By ‘Eucharist’ I mean the ritual of the sacred meal of bread and wine that Jesus asked his disciples at the Last Supper to celebrate in his memory. Other spiritualities and devotions must be integrated into the spirituality of the Eucharist. Eucharistic spirituality is like the Huon Pine which endures for centuries, even millennia, whereas some other spiritualities are more like short lived shrubs or annuals. At the same time as many people are taking up these various spiritualities, there is a dramatic decline in the number of people attending the Christian churches. There seems to be a contradiction here. Why are people taking up these other spiritualities and dropping the spirituality offered by the churches? Some people do not find spirituality in church services, or the spirituality offered is unsatisfying, or it may be obscured by a clutter of distracting detail. Many are not finding the Eucharist a spiritual experience; they are not being nourished when they attend Mass. David Tacey is a lecturer at La Trobe University in Melbourne. He teaches English literature and also offers a course in spirituality, which attracts over a hundred students, making him well qualified to comment on the current interest in spirituality. My hope is that this book will open up for many the richness of spirituality that is built into the Eucharist when well celebrated. As an active priest member of the ‘mainline churches’ I will attempt to show in this book that the Church can provide the ‘enchantment’ and the ‘new life’ that people are hungering for, albeit with some necessary adjustments. I firmly believe the Eucharist is our basic spirituality, the foundation of the spiritual life of Christians. It is the spirituality that Jesus himself gave us. I come from the Catholic tradition so that will be the background from which I speak. I belong to the Congregation of the Blessed Sacrament founded by Saint Peter Julian Eymard in the nineteenth century in France. My spirituality is essentially Eucharistic. The word ‘religion’ today seems to mean for most people the beliefs and practices of an institution such as the Christian Churches, and ‘institution’ has a bad smell for many people. Institutions can become so structured and outdated they no longer have relevance for many, so regular renewals of and within institutions are necessary. The Council of Vatican II in the 1960s is the most recent renewal for the Catholic Church. Spirituality and religion are interdependent. Spirituality is personal but it needs to be inserted into a community that takes part in regular meetings and rituals. Many today feel that religion and spirituality are opposed, but this need not be so as Tacey says, ‘Spirituality is by no means incompatible with religion, but it is existential rather than creedal.’ (p.8). Spirituality today must have a firm basis in lived experience. A big danger in the present spirituality revolution is that many want to ‘go it alone’. People can become fascinated with some discovery about the sacred and try to appropriate it without any guidance or without a supportive community. You can’t play football without a coach and a team, so you can’t practise a spirituality without a community that has wise and experienced people who can provide guidance. A newly discovered entry into the world of the sacred can be a wondrous event but can also be very dangerous – like handling an explosive. Properly used, the product can blow away obstacles on our spiritual journey, but if you mishandle it, you get blown away! Christians have a shared public spirituality in the Eucharistic gathering when the followers of Jesus remember his death and resurrection, learn more about his teachings on the spiritual life and are nourished by his sacramental presence. Luke tells us this is how it was for the first Christians. Religious symbols are found abundantly in the Eucharist. When we put symbols and words together we get ritual, and ritual is an essential ingredient of human activity. Some indigenous groups used to spend two thirds of their waking life in ritual. Our modern culture has tried to drop religious ritual but ritual refuses to lie down. The wedding reception, the twenty-first birthday party and similar gatherings have their own rituals. When the MC asks us to stand to drink a toast, he or she doesn’t say, ‘Please stand up’, rather ‘Please be upstanding’. ‘Upstanding’ is a ritual word, rarely used at any other time. Sporting teams make great use of rituals. The teams have their special colours and their mascots, usually animals such as tigers, bulldogs, bears, to symbolize power and strength. In Australian Rules football when a goal is scored, the goal umpire gives a vigorous two finger indication and waves two flags. This is frequently followed by the players hugging each other or giving the ‘high five’. Life without ritual would be very dull. The question that today’s generation asks is ‘What’s In It For Me?’ One of my aims in this book is to show there’s plenty in the Eucharist for everybody. In fact, there’s all the spirituality you need to have a close relationship with God, to develop a loving relationship with others and to become a fully developed mature person. When you become more mature in your spirituality, you find you are no longer asking ‘What’s in it for me?’ You begin to ask, ‘What can I do for others?’ and ‘What can I do to spread the kingdom of God?’ A Copernican revolution takes place in the depths of your spirit. The universe no longer revolves around you as you shift your focus to God and to others. This is the way Jesus lived. For twelve years I’ve been involved with a team of lay people putting on programs called ‘Life In The Eucharist’ (LITE). Over two days we provide teachings, stories and witness. To some extent I have modelled this book on the LITE format. Before the LITE team provides any input, we ask the participants to share in a small group their own experience of the Eucharist. Many have said that has been one of the best parts of the program as it is the first time they have had the opportunity to share with other parishioners what the Eucharist means to them. At the beginning of each chapter of this book I am suggesting that you, the reader, do the same. Before you read what I have to say, take a little time to write down your answers to the questions; better still, do this with a few friends or parishioners. In that way you will draw from each other what you already know by experience. 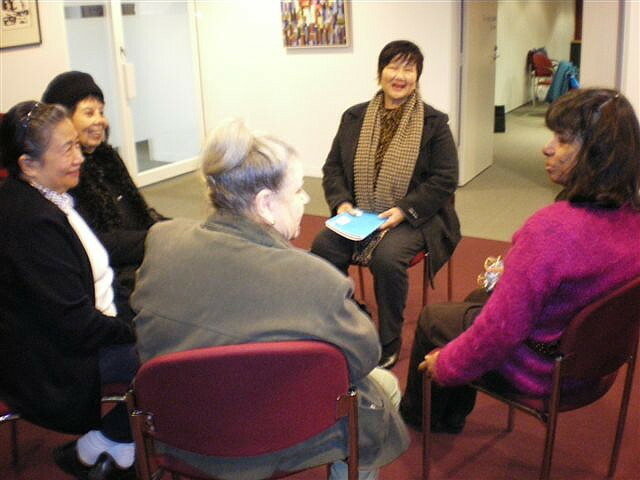 A small group discussion during a LITE program. We find in LITE that witness stories catch people’s attention so I am including many in this book. These stories are from the personal lives of ‘ordinary people’. A few are dramatic, most are ‘ordinary’ but valuable. For most of us our spiritual lives are very ‘ordinary’ – no visions, no locutions, no levitations, no miracles. But in this ordinariness there is beauty, there is a movement into the sacred, there is an encounter with the risen Christ. In this book I have tried to avoid unnecessary theological terms. However, I think it’s always useful to know some new words to improve our understanding and I have provided a glossary to explain the more unfamiliar words. I’ve written for the ordinary person but I’m conscious that many ordinary people today are well educated, some with degrees in theology and scripture. Our spirituality must be based on sound teachings. I have used the teachings that Jesus gave us in the gospels, the authentic teachings of the Church and the research and insights of recognised scholars. My conversations with people indicate there is a desperate need to explain the fullness of the Eucharist. There is so much misunderstanding about this wonderful sacrament that a lot of catechesis is needed to correct wrong emphases and, in some cases, actual errors, that have crept in over the centuries due to cultural and historical influences. We can benefit enormously from the scholarly research that has been going on into our ancient traditions over recent years. This is readily available for academics but not so easily accessible to the laity. One of my aims in this book is to offer some of the fruits of this valuable research to the lay person. In 1996 a Catholic chapel was set up in the Eastland shopping centre in Ringwood, a suburb of Melbourne. I am one of the priests of the surrounding area who volunteered to be rostered to celebrate a 1.05 p.m. ‘Mass in the market place’ Monday to Saturday. As I don’t have parish responsibilities, I’m more available than most priests, so I have the joy of celebrating there once or twice a week. Since beginning to write this book, I’ve got into the practice of having a coffee with one or two people after Mass. This has given me the opportunity to find out what the Eucharist means to them, why they bother to go at all let alone on a weekday, and whether they have had any significant experience at Mass. It has been a fascinating and delightful encounter and many of the stories in this book have resulted from my ‘coffee ministry’. I have found that Catholics love to talk about their experience of the Mass when they get this opportunity – as they do in the LITE programs. I strongly encourage you to share your experience of the Eucharist with others using the questions at the beginning of each chapter. You will find it a very enriching experience. I have begun the book with a chapter on the many changes that have occurred in the celebration of the Eucharist over the centuries. Knowing about this evolution of the Mass helps us to understand where we are coming from and why the Eucharist is being celebrated as it is. Then there are chapters on the various parts of the Mass: Introduction, Liturgy of the Word, Liturgy of the Eucharist and Concluding Rites (see Contents). There is a chapter on how the Mass continues during the week, a chapter on the Abiding Presence and one on Prayer before the Blessed Sacrament. These are followed by the link between the Eucharist and Reconciliation, Nourishment, Transformation, Covenant, Sacrifice, Memorial, Hope, Ecumenism, Cosmos, Mystery and Living Simply. A concluding chapter finishes the book. Included in the book are stories of personal witness – what the Eucharist has meant to particular individuals. I’ve added a glossary to explain some words that may not be familiar to readers. In the text I quote a lot from the Eucharistic prayers using the translation approved by Pope Paul VI in 1969 and which is in use at the time of writing this book. I’ve added an appendix of these prayers so that you can become more familiar with them and use them for meditation. They contain rich Eucharistic spirituality.